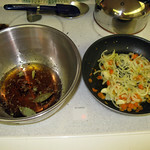 To prepare the marinade, slowly cook carrots, onions, and garlic in olive oil. Mix other ingredients (less the salt) in a bowl large enough to hold the pork shoulder. Add the cooked carrots, onions, garlic, and oil to the marinade. Rinse pork shoulder and pat dry. Rub the salt into the pork. 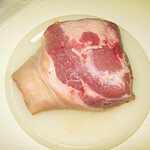 Place the pork shoulder in the bowl and baste it with the marinade. The shoulder should marinate for three to four days, turning the meat and rebasting with the marinade twice a day. 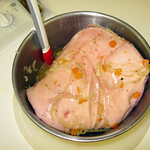 When ready, rinse the pork shoulder and discard the marinade. Place the meat in a roasting pan, fat side up, with about half a cup of chicken stock. Cook in a moderate oven (300 degrees) for six to eight hours. You can also use a slow cooker/crock pot if you have one large enough. Serve with boiled new potatoes (skin on) and green beans. The marinade, as noted, is a Julia Child recipe. It’s meant to give the pork a wild boar flavor. Having never tasted wild boar, I can’t attest to its success, but will note that it tasted great. 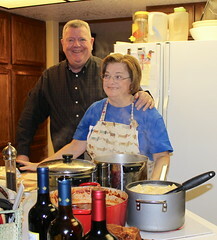 Unless you’re feeding eight people at the first sitting, there’ll be a lot of pork left over. We made pulled pork from our leftovers, cutting away all the fat, discarding the bones, and shredding the meat to serve on buns with barbecue sauce. This is an economical cut of meat that will give you two or three meals, easily. © 2010 – 2015, Crouton deMenthe. All rights reserved.